XSLT, DOM, SAX, FOP, Data binding etc. 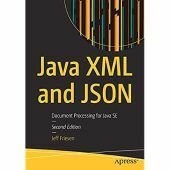 Java XML & JSON: Why do you name your book that way since these are different technologies ? Java XML and JSON: When would you choose one over the others? Java XML and JSON : what is new in this second edition ? No need for Xerces since Sun includes it in the jvm? Best API to update an XML document! XStream + variable as an attribute to another variable which is tag.